Bering survived. And in addition to relief, the fading of his suicidal thoughts brought curiosity. Where had they come from? Would they return? Is the suicidal impulse found in other animals? Or is our vulnerability to suicide a uniquely human evolutionary development? In Suicidal, Bering answers all these questions and more, taking us through the science and psychology of suicide, revealing its cognitive secrets and the subtle tricks our minds play on us when we're easy emotional prey. Scientific studies, personal stories, and remarkable cross-species comparisons come together to help readers critically analyze their own doomsday thoughts while gaining broad insight into a problem that, tragically, will most likely touch all of us at some point in our lives. But while the subject is certainly a heavy one, Bering's touch is light. Having been through this himself, he knows that sometimes the most effective response to our darkest moments is a gentle humor, one that, while not denying the seriousness of suffering, at the same time acknowledges our complicated, flawed, and yet precious existence. 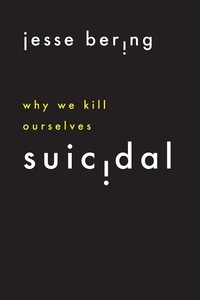 Authoritative, accessible, personal, profound--there's never been a book on suicide like this. It will help you understand yourself and your loved ones, and it will change the way you think about this most vexing of human problems.